Returning to town for the second time in just six months, Seattle feminist poppy punk group Tacocat are hitting the east side for the first time for a show tonight, Oct. 6 at The East Room with locals Daddy Issues and Idle Bloom! Not just an immensely fun live band, but also a socially important one, Tacocat released one of our favorites albums of the year in their latest, Lost Time. Whether you missed a chance to see their last outing, or, like us, you simply can’t get enough, but sure to grab your tickets right here and head to the The East Room for what’s sure to be one of the fall’s best shows tonight! After meeting and quickly bonding over shared taste, art, and ideology in their teens and early twenties, the members of Seattle’s Tacocat – now real life bffs – first formed the band nine years ago. Originally a largely DIY endeavor, the group self-released a series of EPs, splits, and their debut full-length, Shame Spiral, before getting snagged up by Sub Pop imprint Hardly Art for 2012’s Take Me to Your Dealer EP and subsequent sophomore effort, NVM. It was the latter that would help boost Tacocat’s presence, fueling an international tour, finding critical acclaim, and putting them on our radar (we first caught the group live at The Stone Fox in 2014, and have been hooked ever since). Generally labeled feminist punk, Tacocat (three girls and a guy, or, as we call them, four humans) sing about queer issues, Seattle, pop culture, social injustice, worker empowerment, and, of course, feminism, all funneled through a comedic, lighthearted, and pop-driven approach that makes smart, important, and socially aware songs incredibly fun! Their latest, and best LP to date, Lost Time, arrived earlier this month; named in reference to The X-Files, and chock full of hypnotic, substantive tunes, it’s already a shoe-in for “best of 2016.” Just as fun live as they are in recording (or, as their music videos would suggest), Tacocat are a can’t-miss act not just for the importance of their culturally ideologically and how expertly they present it, but also because they’re simply a damn good band. Hailing from right here in Nashville, Daddy Issues actually got their start as a parody of Twitter account before taking up instruments and deciding to make a go at becoming a proper band (a refreshing anthesis to the over-trained, uber-techincal typical Nashville trajectory). A pair of early singles, “Pizza Girl” and “Ugly When I Cry,” helped garner immediate attention in 2014, paving the way for the gals’ 2015 debut, Can We Still Hang, released through tastmaking local label Infinity Cat. With a self-described sound that “lies somewhere between witchy grunge and surf glam,” the trio’s lyrical prowess, a mix of empowerment and lighthearted, sarcastic self-awareness, provides a surprisingly poignant juxtaposition to their raw instrumentation, and has helped the group quickly find themselves on the road, on festival bills, and the subject of national press. A perfect compliment to Tacocat, Daddy Issues are not just a local opener, but are on this whole tour leg, and their presence helps cement this lineup as essential. Idle Bloom have been one of our favorite local acts since day one, when they emerged from the ashes of Fancytramp, and we cannot think of another Nashville band better suited to open this show, paired perfect in both style and sensibilities. Influenced by many of the same punk, alternative, and indie sounds, as well as ideology as Tacocat, the group, who dropped their debut EP, Some Paranoia, late last year, are a ton of fun to catch in person, so be sure to show up early and see what the buzz is about. 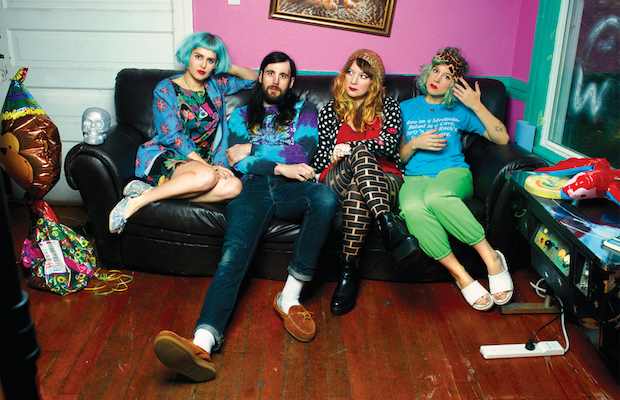 Tacocat, Daddy Issues, and Idle Bloom will perform tonight, Oct. 6 at The East Room. The show is 18+, begins at 8 p.m., and tickets are available for $12. OJR & Kid Freud Advance To Nashville Finals In Road To Roo!